Series 6 has easily been Downton’s best in years. Episode 6 might be the second weakest of the series, after the premiere, but there was still plenty to enjoy. I certainly could not have said that about the past two years. The pacing of the Mary/Henry romance is somewhat unnecessarily problematic. Mary was right to acknowledge that it was going fast, but she doesn’t need to be on the same page as the storyline its elf, especially when Fellowes can advance the timeline at his whim. It isn’t just going fast; it feels rushed. I’d be more sympathetic if the upstairs character hadn’t been stuck in a bizarre holding pattern for the first three episodes waiting for Tom to return. He simply should never have left, or returned after the first episode. Looking back on it, Carson and Hughes should probably have married earlier as well, though I’m quite tired of misogynistic Carson. Couple that with the Baxter drama and you have a decent amount of filler for a series that doesn’t necessarily need it. It could be because of Matthew Goode’s filming schedule, but it’s a shame that we only get Henry Talbot for a little more than half a series, especially when the first couple episodes were so stagnant for the Crawley’s social life. 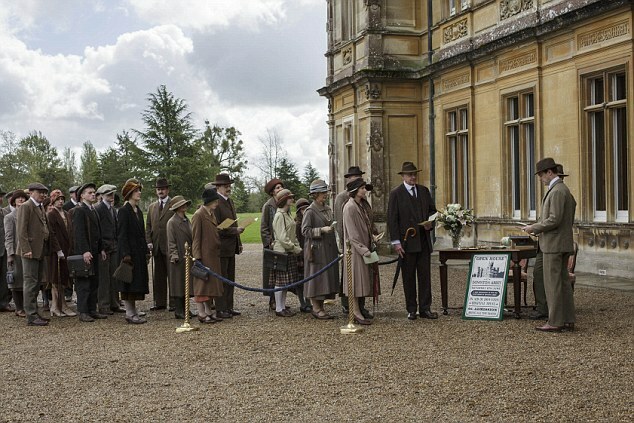 This series has managed change quite well, recognizing that Downton is at its best when it weaves change into its storylines rather than use it as the storyline itself. This episode balanced that well, which was surprising since change was the storyline. The open house was a bit of a bore, but does hint at what’s to come for that lifestyle. I was glad that several characters brought up how odd it was to have people pay to look around the Abbey. It didn’t help that no one really prepared. Watching Cora, Edith, and Mary stumble over their tours was mildly amusing, I would have been pretty pissed off if I was a paying customer. I definitely would have stolen some silverware, a snuff box, and Mr. Molesley. Donk being in bed all episode was kind of a drag, though I enjoyed his interaction with the boy. I’ve been critical of the Dowager’s behavior throughout the hospital plotline, but she had a right to be pissed off in this episode. It makes sense that she should step down given her age and opposition to the takeover, but Cora, Clarkson, and Isobel didn’t need to go behind her back like that. Why couldn’t she kick off the ceremonies? It wasn’t like everything was finalized by then. Cora was deeply immature and disrespectful in this episode and continues to be one of the show’s least likeable characters. Poor Barrow. One does have to wonder how hard it would be for Lord Grantham to secure him employment somewhere. Under butlers may have been a thing of the past in 1925, but butlers certainly weren’t, especially new ones who would be less expensive. The other big problem I have with the whole downsizing thing is Molesley’s lack of role in it. Yes, we know he’s got his teacher storyline, but why does that mean he needs to be excluded from Donk and Carson’s discussions? Barrow doesn’t necessarily look like the obvious man out with a fifty-year-old footman running about. It’s obvious that a Carson/Hughes retirement is around the corner and that Barrow is being groomed to be the next butler with Molesley teaching and Andy helping out part time when he’s not farming with Mr. Mason. The question really revolves around what to do with Barrow in the interim. It’s not too surprising to see that the show decided to go down the homosexuality route. I wish it hadn’t though. Fellowes has always done a good job portraying Barrow’s homosexuality in a manner that respects history while catering to an audience that is far more sympathetic than the people of the time would be. But I don’t think it needs to be a plotline anymore, especially not in this slightly modified rehash of what happened with Jimmy back in series three. I’d much rather have the show confront Barrow’s deficiencies as a human being at this juncture in the show. Molesley finally gets to do something! I hope his exam goes well. It’s time for the true hero of Downton to get a win. Carson continues to be a terrible husband. Why did they even get married? Between that and his lecture with Barrow, he’s definitely the biggest stinker of the episode. Fellowes really has done a fine job making Carson as unlikable as humanly possible this series. He’s been cold to just about everyone except for his Donkship. It’s hard to really see where he’s coming from in questioning Barrow when he’s been so cold to his under butler in just about every other encounter. Isobel’s romance with Lord Merton was inevitable. It’s not terribly interesting, but it doesn’t take up much time either. I am mildly excited to see Larry Grey again. Dinners with him are always exciting! I wasn’t a fan of the Edith/Mary feud. It’s tiresome and Mary should’ve been able to figure out the Marigold secret by now. I assume it will lead to some sort of resolution between the two, but I can’t say that I care. Daisy’s behavior was also unnecessarily odious. Spiteful Daisy has never been enjoyable. Why does she care if Patmore and Mr. Mason give each other vegetables? Oh the Bates . Always something with those two. Why can’t they be happy? It was nice to see Evelyn Napier again. He continues to be one of the show’s best longtime tertiary characters. I wonder if he’ll speak to Henry Talbot about a certain Turkish gentleman. Despite some criticisms, I did enjoy this episode. It wasn’t as exciting as previous ones, though it was far less bloody. His Donkship appears to be in the clear, which makes me wonder who will have a tragic ending. Barrow looks to be the obvious candidate, though I wouldn’t rule out the hall boy who has to clean the Carsons’ silverware. Leave a comment if you’d like to share your prediction.